Basa could be labelled catfish or river cobbler. It is a white fish which is as good as any other. You'll see how truly versatile it can be and it's also reasonably priced against other white fish such as cod or haddock. You can buy it fresh or frozen. Dip in and if you've got any questions, please ask me. The sauce can be cooked ahead - even the day before - then reheat before adding the fish fillets. You can use any type of white fish and this tomato sauce is ideal for using with seafood as a pasta sauce - it's really versatile. Soften the onion in a large frying or saute pan - about 5 minutes. Add the tomatoes, sugar, thyme and soy sauce. Bring to the boil and simmer for 5 minutes until the sauce is thickening. Reduce the heat to a bubble and slip the basa fillets into the sauce. Cover with a lid and cook for about 8 minutes, until the fish flakes. 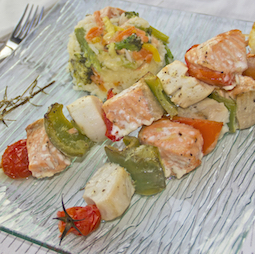 Serve with plain new potatoes and fresh buttered vegetables. It's a very quick meal to make and is ideal for a family meal or a dinner party. The sauce can be prepared early which means it can be ready quickly without having to worry about spending too much time in the kitchen. You can just get on with preparing your whole menu, knowing that all you have to do with the fish is simmer it for 8 minutes. 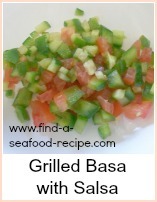 The second of the basa recipes is equally good cooked on the barbecue or under the grill if the weather turns bad. Ideally, you would need chunky basa steaks, but they mostly come in slender fillets. Thread the fillets onto the skewers between the peppers and tomatoes to make a delicious and quick kebab. These are good served with pitta bread, shredded cabbage and chopped tomato and cucumber. Cut the fish into slices. Take the peppers and scorch them over a hot flame until the skins blacken. Cut into chunks, removing the seeds. Take your onion pieces and scorch them for a minute or so until they’re soft. Take a skewer and thread a piece of basa, a piece of red and green pepper and a piece of onion until the skewers are full - push the ingredients up together to make it a solid skewer. Squeeze lemon juice over them then brush with olive oil. Barbecue or grill for 8 minutes, turning every 2 minutes – brush with oil to prevent the kebabs drying out. Serve with warmed pitta breads and salad. 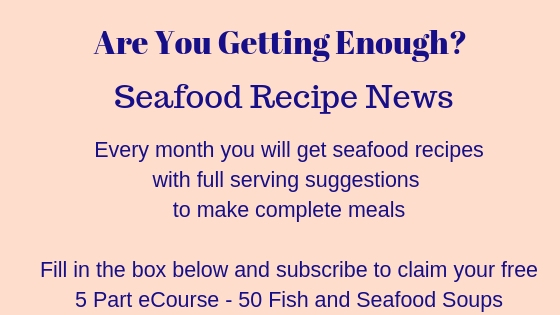 You can use this recipe for any firm white fish - halibut, monkfish, turbot, cod, haddock - as long as you can cut it into chunks, then you can use it. 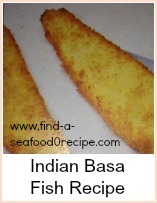 The third of the basa recipes is simple to prepare and baked in the oven. It uses an easy tomato sauce topped with breadcrumbs. The sauce means that you can have plain boiled veg with it and have none of the problems of 'what sauce to serve with fish'! It's suitable for any white fish (or dare I say it, chicken breasts) if you can't get basa. Heat the oven to 190C, Gas Mark 5. Grease a roasting tin which will fit all fillets in one layer. Mix the breadcrumbs with the dill. Mix the tomatoes with the garlic salt and tomato puree. Put the basa fish in the tin and top first with the tomato mixture, then sprinkle over the herbed breadcrumbs. Bake for around 15 minutes until the fish is firm to the touch. Transfer to individual plates, sprinkle parsley over and serve with some plain new potatoes, green beans and/or broccoli or veg of your choice. A very simple meal for mid week or a special occasion. 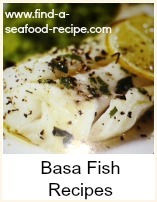 A great selection of basa recipes showing you just how versatile a fish this is. Kebabs, with herbs and in tomato sauce plus loads more. Always tasty and quick to prepare.